Adaptation and innovation are the key to success in the modern industrial environment. That’s why GE is working closely with partners throughout global industry to deliver innovative solutions that adapt to their particular needs. If we’re building smart solutions, where better to start than with the foundations of construction itself: steel. The world produces roughly 1.5 billion tonnes of steel annually[i]. 42[ii] million tonnes of that comes from the POSCO Pohang Works steel facility in South Korea. That’s enough to steel to build over 1,100 Petronas Towers, each year. Those numbers illustrate POSCO’s impact as one of the world’s largest steel producers. Like many industries however, steel production is facing a challenging global landscape. China, only recently experiencing a thirst for imported steel to meet the needs of a rampant construction industry, is expected to see demand fall by 4% this year. This follows in 2015 which saw steel demand globally dropping by 3%. Meeting global steel demand while addressing the challenges of a turbulent landscape calls for innovation. Delivering sustained production while remaining competitive will require efficiency. At GE, we’re working with POSCO to deliver both. The modern industrial environment is one where we must adapt. Expertise are not limited by organisation or industry anymore, but enhanced by digital opportunity and multidisciplinary understanding. At GE, those are the skills which ensure we excel. GE’s team at POSCO will retrofit four Toshiba industrial steam turbines, showing that industry leading knowledge can be adapted to deliver benefits servicing even non-GE supplied power equipment. These upgrades will improve the supply of process steam from 40 tonnes an hour up to 70 tonnes an hour, enabling the site to dramatically increase process steam efficiency while simultaneously retiring older engines on site. The implementation of these upgrades is not simply a mechanical change. Leveraging its digital industrial capabilities, GE will deliver efficiency improvements to the 50-year-old steam turbines that ensure POSCO enjoys competitive steel production long into the future, with newly designed replacements of the turbines’ internal components, including a digital electro-hydraulic controller, a condition monitoring system, generator stator rewinding, generator rotor refurbishment, exciter rewinding and turbine installation. Tiny robots mean big reductions in downtime. The expertise and benefits in GE’s work with POSCO represent just one example of the capability which emerged from the acquisition of Alstom in 2015. Alstom’s predictive maintenance portfolio offers huge advantages to customers when paired with GE’s own role as a leader of digital industry. These capabilities are already providing benefits throughout the Asia-Pacific region. And it’s not just smart people delivering these changes. It’s smart robots too. Inspection and maintenance are a key aspect of efficiency in power generation. Yet downtime as a result of maintenance can have a huge impact on generation and production. 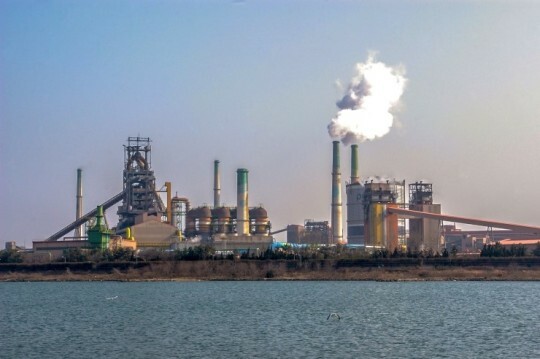 Just one days downtime for maintenance across the POSCO plant would amount to 115,000 tonnes of lost steel production. Ensuring that power generation faces minimal disruption while maintaining safety and efficiency is a huge challenge. Thankfully we’ve got a tiny solution: robots. GE’s DIRIS ‘small’ robot systems offer a precision tool to inspect power generation equipment without the lengthy process of rotor removal. Able to probe through gaps as small as 9milimetres, the DIRIS robots can carry out a comprehensive inspection that detects the warning signs of mechanical stress with minimal downtime. Alongside GE’s TurboRotoScan technology, utilised to test the condition of rotator retainer rings, this small solution is serving up some massive benefits, with up to 60% cost reduction and time saving over rotor removed inspection alternatives. GE has already signed an agreement with Alinta Energy to boost the reliability of 19 generators across Australia and New Zealand. This will reduce the average 3 weeks of generator downtime for inspection and maintenance to just 2-3 days. If our fleet of tiny robots discover a problem, customers enjoy an informed position to assess the needs for maintenance and repair. Implementing these tiny robots for Alinta Energy will mean major inspections can be carried out every 4 years, half the 8 years previously scheduled, doubling the opportunity to unearth vital component deterioration yet simultaneously reducing the overall availability of the power generation units. Innovation is small changes and big opportunity. Both our partnership with POSCO and agreement with Alinta Energy shows how GE’s predictive maintenance capabilities are not limited to their own installed technology, but provide a wide-reaching solution to non-installed GE power units. Thanks to our fleet of tiny robots, the opportunities for wider efficiency are even more impressive. GE estimates as many as 3,000 generators in the Asia-Pacific region alone could benefit from this predictive maintenance technology. We’re building an efficient world, and working with partners to ensure the benefits are widely appreciated. The capabilities of our tiny robots will play a big part in delivering that, but so too will industries willingness to adapt. The DIRIS and TurboRotoScan technologies ability to inspect generators from a huge range of original equipment manufacturers means we’re in a position to offer a solution to partners of the future, regardless of the suppliers of equipment in the past. Whether you’re powering the production of steel to construct the future, or just powering the future itself, innovation and adaptation are certain to play a key role. If industry are truly looking for opportunities to grasp, well they don’t come much bigger than GE’s predictive maintenance technologies, and our fleet of tiny robots. Brittany Singh: How Can We Stay Smarter Than Machines?